The Sword of Damocles is the direct manifestation of the Kings' powers and their state as a King. If they were to lose control of their powers due to personal emotions like Mikoto's rage of Tatara's death, the swords start crumbling. This is due to his Weismann levels raising as his compatibility as the Red King is falling. 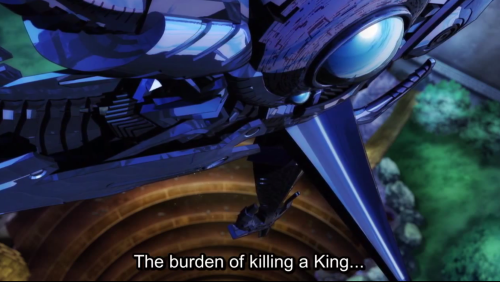 A similar thing is happening to Reisi Munakata, where due to him killing Mikoto, that burden of killing a king is causing his sword to start crumbling as well. Mikoto's Sword of Damocles got crumbled because of 2 cases. Firstly, at the start of the series, we came to see his damaged sword. His swords is the most damaged one shown so far. His sword was in that state not because he killed a king, but because of his reckless use of power. In the light novels, Mikoto states that he wants to release all his power and be free, and that is what Munakata calls reckless use of power. His clansman however, although he does love them, they are more like chains that hold him down, especially Tartara. Now that Tartara died, the biggest chain that was holding him down is gone. Over the years, Mikoto's sword got damaged because of his reckless actions. As a result, he got weaker. He only lasted this long because of his clan that held him down. The colorless king himself stated that Mikoto would have ended up dying even if he didn't prove him because of his mind set of wanting to release his power and be free. The burden of incinerating the colorless king is what finally made his sword fall.